Some time ago I published one of my most popular blog posts Must Have Software For Virtual Assistants. It was such a hit that I decided to publish Must Have Software For Virtual Assistants Part II. I get emails nearly every week asking about the programs, apps, software, etc., I use. I’m always happy to lift the curtain to give people a peek but, I figured instead of answering each email individually, I've decided to write this blog post. So without further adieu, here is the list in no order of importance. I adore Gmail – not just for the easy-to-navigate interface, but because it’s so easy to organize! You can also add fantastic apps like Boomerang to make managing your overflowing inbox a breeze and Rapportive for helping me see who I’m emailing with. It goes without saying that virtual assistants write a lot of emails. Whether you're writing emails to prospects or to a client, it's crucial that you use correct grammar and punctuation. Grammarly is my go-to tool to check everything I write and I can't live without it. No seriously, I don't publish anything anymore without Grammarly. What I love about Grammarly is you can add their plugin to Google Chrome and it will check your writing whether you're writing an email, a social media post or a blog post. It literally follows you around your computer screen to where ever you're writing to save you from making embarrassing mistakes. Google Drive (formerly known as Google Docs) is an online software suite similar to Microsoft Office. I use it to create action plans for my clients, as well as saving all my client specific information. It’s easier than DropBox and accessible whether I’m on my desktop computer, my laptop, or someone else’s computer. 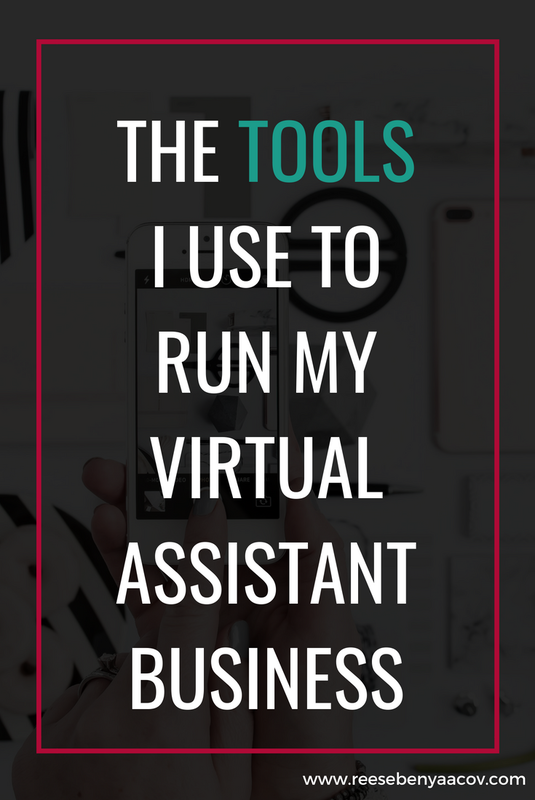 It's pretty much vital to any virtual assistant. DropBox is another must have document sharing software. You can save any type of file to DropBox. Just create an account and share folders with your clients and you have a great way to share files/folders instantly. PayPal is the golden standard. Your clients don't have to have a PayPal account to pay your invoices with PayPal. All they have to have is a valid credit card. It's a simple and easy way to start taking payments as a new online business, and I recommend it to everyone starting out. Freshbooks has a ton of features. From time tracking, invoicing, and accounting this is an all-in-one solution that I've been using since 2008. I've researched competitors and I've always come back to Freshbooks. Freshbooks is free for just one client (bummer), after that it's $19.99 for their seedling plan. I have to offer up an honorable mention to another invoicing and accounting tool called Harvest. While I don't use Harvest many virtual assistants swear by it so check both options out. I've been using Skype for as long as I can remember. It's super reliable and you can share your computer screen with for free during your call. That said, Google Hangouts has been amazing and I've got to give credit where credit is due. What I love about Google Hangouts is you can add up to 10 people to the call at no extra cost. Both Skype and Google Hangouts have smart phone apps so you can hold a conference call from your phone when you're not at home. Super helpful when you clients need to talk you when you're not at home. I've been using Asana for awhile now but I've also used RedBooth (formerly TeamBox) and I love them both. Whether you have one client or several you must use a project management software to stay organized. If you have virtual assistants that you sub-contract work to you can add them as team members to both platforms and have complete visibility as to where things stand with each project/client. This is my number one recommendation to people starting out online who want to set up shop quickly and easily. For $5 a month e-Junkie lets you sell your digital products and programs simply by creating a new product, uploading a digital file or pointing to a page on your site for a program and naming your price. Then you can choose from a range of payment methods like Google Checkout or PayPal and embed that code straight into your website o ensure people can `buy now’ and setup a simple affiliate program. This is a great suggestion to clients who want to sell stuff online and want you to manage everything from the backend. Super simple and cost effective. I've been using GoDaddy since I created my first website. I only use them to purchase my domain names. I never use them for hosting. See below for my web host recommedations. I've been using HostGator for awhile now and I've got no complaints. They give you a variety of plans to chose from and allow you to upgrade at any time. I went from their Hatchling plan of $3.95 per month to their Baby Plan when my traffic increased. BlueHost is what my clients use to run their WordPress sites and I love their customer services and ease of use. Highly recommend! I've been using MailChimp for a few years now and I love it. They offer a free plan for up to 2,000 subscribers. I recommend it to anyone starting out in email marketing because it’s so simple to use, and easy to navigate. You can create campaigns easily and setup autoresponders to go out automatically each time you get a new subscriber to welcome them. Whether I need an image for a blog post I've just written or my client needs an photo touched up for his/her website I use PicMoney or Canva. PicMonkey and Canva are favorite tool for entrepreneurs because they are both easy and quick, allowing you to add text and overlays to photos for blog posts. If you can’t afford Photoshop check them out. I love my WordPress website and I firmly stand behind this platform and encourage other virtual assistants to set up a WordPress site. WordPress offers thousands of free themes. Once you've loaded up your theme WordPress sites are easy to update. If you can use Microsoft Word than you can add a new page on to your WordPress site. There are plenty of free tutorials on YouTube on how to get your WordPress site online but I'd recommend checking out Lynda's WordPress Tutorials. They are free and have various skill levels starting from beginner to advanced WordPress training. Once you install WordPress you have to pick a them. Right now I'm loving two themes for WordPress. They come from Elegant Themes and the first is called the Divi Theme. Divi is a great theme because it's responsive across all devices (phones, tablets, etc) and is super easy to use. The next theme that's a huge hit is BlueChic Themes and my personal fav is the Jacqueline Theme. These themes are great if you have a small budget for website design. What software are you using to run your virtual assistant business? List your suggestions below in the comments so everyone reading can benefit.